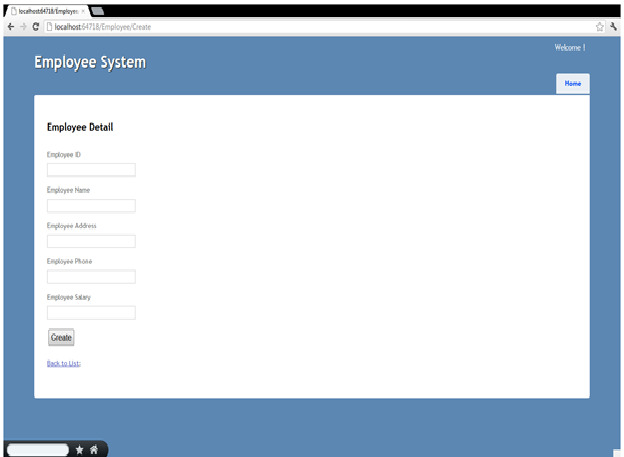 Employee System is basic application build from the ASP.net MVC. It’s a starting point to know what you can build from ASP.net MVC with cleaner code.I am using the Static List data for the simplicity and to know how to use LINQ in different Scenario. 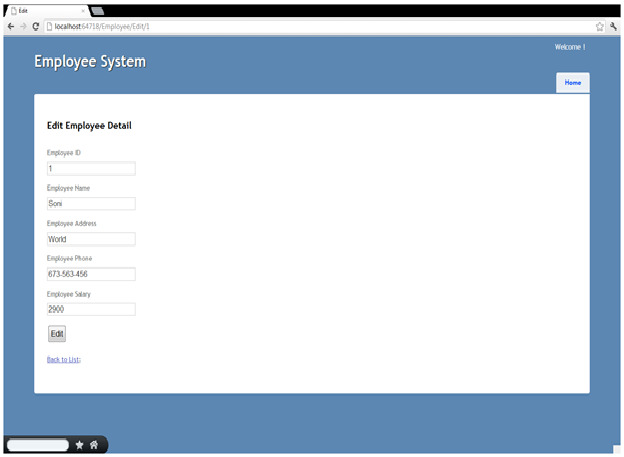 Employee System is basic application build from the ASP.net MVC. It's a starting point to know what you can build from ASP.net MVC with cleaner code. It has the Create, Edit, View Detail and Delete functionality. I am using the Static List data for the simplicity and to know how to use LINQ in different Scenario. Below is the screen shot which you will be building today. 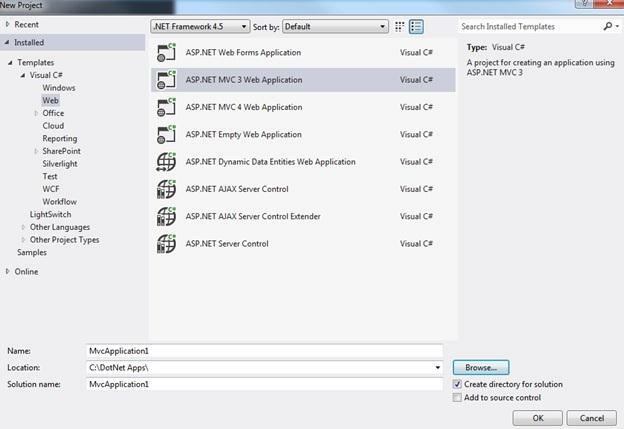 Now let's dive into how to create ASP.net MVC Application using Visual Studio 2010 or 2012. Here i am using VS 2012 but you can create using 2010 also. Create new Project and Choose ASP.net MVC template from dialog box and create Intranet based application as Shown I below figure. 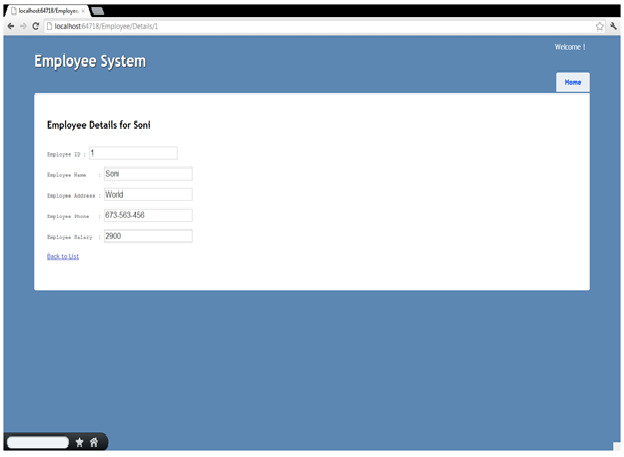 Let's start with Listing (Index) controller which will display the List of Employee as show in Figure 1. 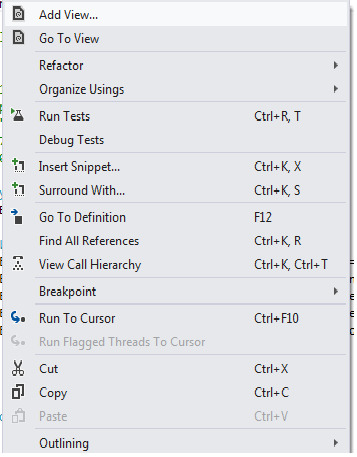 Create controller called EmployeeController.cs under the Controllers folder in visual studio. EmployeeController will have all our ActionResult or ViewResult for Create, Edit, Delete and View Details actions. In above listing we are using the Employee Model class to store Employee details. Employee model class has the below properties and methods which we will be using throughout our application. Create Empployee.cs class under the models folder in Visual Studio and paste the below code in that class. Let me take some time to explain our Model class. As you can see we have some set of properties which will hold our Employee data. If you notice we are using the Annotations (Attributes) for Validations, Messages for each property. In MVC we can annotate the Model for the Error messages, validations and so on. All the annotations are defined in using System.ComponentModel.DataAnnotations namespace. We have two important pieces in place i.e. Controller and Model. Now we need UI which can display the List of Employees with some Actions Links. 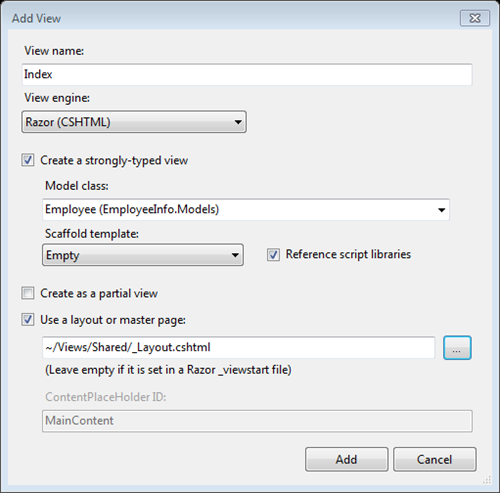 In MVC, View is used to display the UI components and renders the HTML output. Click on Add View menu and it will open the box as shown below with Index as the View name by convention. Choose View Engine as Razor as we will be focusing on this engine in this tutorial. Select the Create a strongly-typed view as we will be using Model which is already described above. You can leave layout manager empty or choose one which you want to use in your application as shown below. It will create Index.cshtml view page. Note: I have given overview of Razor view engine and Razor syntax in my previous article here. Please take some time to go over that. Let's take one step ahead and finish all the actions in controller class for Create, Edit, Delete and Details. Logically when we call the create action it should add the employee in our list and display the results with the new data. On edit we are going to edit the details of the employee except its ID. Here we have the static data so i am removing and adding the updated data in our list for simplicity. On Delete action we will be removing the employee from the list and go back to the list page with updated data. Detail View is just to display the employee information in form manner instead as list. You can update the project as per your requirement and to learn different aspects of the MVC model here. In all of the scenarios I have used LINQ to query the data from the List as I like LINQ now. When you click on the Create New link on the first page, It will call the Create action from the controller and render the View associated with that controller i.e. Create.cshtml. The HTML output will look like as shown below. You can provide the data and hit create button which will call the POST action i.e. public ActionResult Create(Employee emp) which will pass the Employee form data back to your controller. When you click on the Edit link for that employee, It will call the GET edit action from the controller and render the View associated with that controller i.e. Edit.cshtml. The HTML output will look like as shown below. You can update the data and hit Edit button which will call the POST action i.e. public ActionResult Edit(Employee emp) which will pass the Employee form data back to your controller. When you click on the Details link for that employee, It will call the GET detail action from the controller and render the View associated with that controller i.e. Details.cshtml. 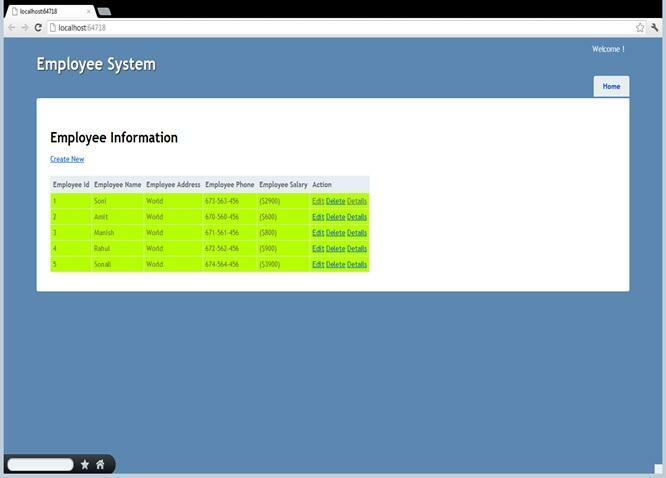 The HTML output will look like as shown below.